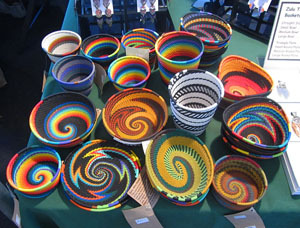 Our mission is to help low income Craft Producers in Developing Nations market their crafts in the United States. We fulfill this mission now by purchasing these crafts directly from the people who make them - the Producers - and retailing them to you in our Amazon listings. We also sell at Gem Shows, Bead Shows, Quilt Shows, and County Fairs all over the western United States. Just click on the SHOW SCHEDULE link at the top of this page. We sell only Fair Trade Crafts. We believe this is the best way to end poverty around the world. Fair trade is a system of exchange that seeks to create greater equity and partnership in international trading. By approaching development as a whole process (rather than just a fair price), fair trade organizations cultivate partnerships with their suppliers and contribute to the development of communities. Fair trade is not about charity; it uses a fairer system of exchange to empower producers and to create sustainable, positive change. 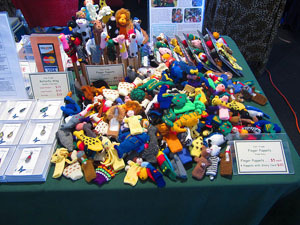 Here are some of the items we sell at Craft Shows and Quilt Shows. In the top picture are Telephone Wire Baskets from South Africa. Below the baskets are Butterfly Wing Jewelry from Peru. In the bottom picture are small Finger Puppets from Peru. 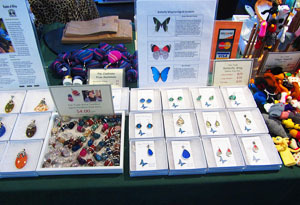 We also have lots of other Fair Trade jewelry and crafts. To see more pictures and descriptions of the items we sell at shows just click on the Producer Profile link at the top of this page.